Welcome to Sing The World! Sing The World is a Newbury-based a capella community choir, which has been running successfully now using Natural Voice principles for over a decade. We meet weekly on Monday evenings during term time at Speen Parish Hall in Newbury, singing music drawn from a wealth of singing traditions from throughout the world. As we mostly teach songs by ear, to join us you don’t need to be able to read sheet music and there are no auditions – complete beginners and experienced singers are equally welcome. 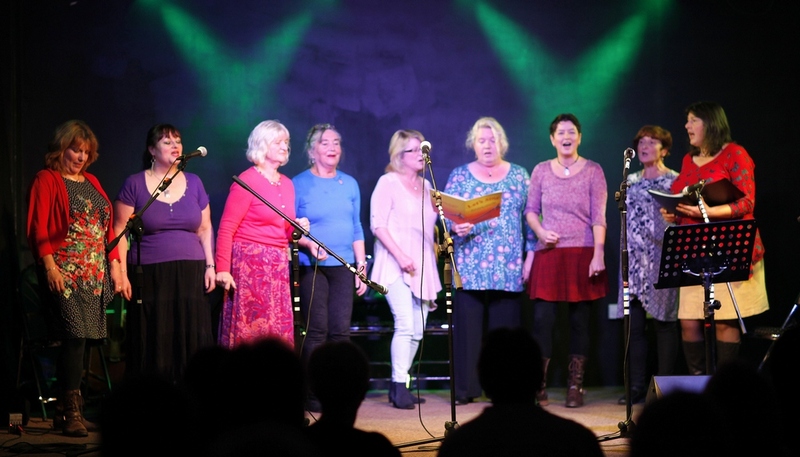 We aim to make our sessions uplifting, energising and inspiring – just come along and enjoy the harmonies! Our new term starts on Monday 14th January 2019: it’s £50 for the 12 week term, or £5 a time. If you want to try us out you can have a free introductory session. Sing The World is about singing for the joy of it and there is no expectation for members to perform, but some of us do perform occasionally. If you come and sing with us and think you’d like to try out performing as well, just let us know. We also host occasional Saturday singing workshops so look out for these. See our Singing Workshops page for more details. To download an information leaflet about Sing The World, please click here. Becca Flintham will be leading her ‘Raise Our Voices’ Workshop in Stockcross Village Hall on Saturday 20th October. Please see our workshops page for more details.